Once labeled "livestock" and relegated to rural farms, chickens have made the move to the city and to "pet" status for many Americans. More backyard coops have sprouted up across the nation over the last several years, providing homeowners companionship, entertainment and fresh eggs on a daily basis. But do chickens make good pets? They can, depending on owners' expectations and preparedness. 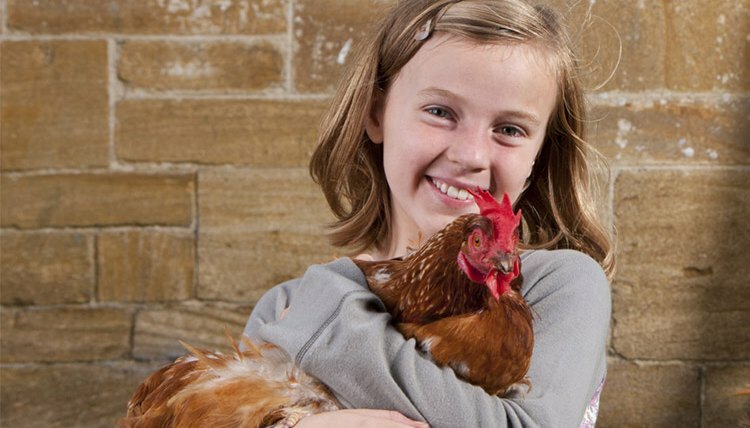 There are a few necessities to raise pet chickens properly. Backyard hens require a decent amount to thrive. First there's the coop, which should have a minimum of 4 square feet of space per chicken, along with food and water containers and a comfy roosting area. Ventilation is imperative to keep chickens healthy, and an outdoor run with at least 10 square feet per critter is also a must. This space gives your birds a safe place to enjoy fresh air and sunshine without falling prey to raccoons, foxes, opossums, coyotes and the like. Also be sure to clean the coop of manure, feathers and other debris daily, and maintain a comfortable temperature no matter the elements. Like nearly every other pet out there, chickens need fresh food and water daily. Sounds simple enough, right? Well, kind of. Chickens are known to eat just about anything, but that doesn't mean they should -- particularly if you're looking to enjoy free range, organic eggs harvested in your own backyard. Allowing chickens to do what they do, meaning eat insects, seeds and berries they find while foraging, is key, but you will likely need to supplement their natural diet with an organic feed to ensure they receive proper nutrition. Talk to your local feed store for help determining what's best for your brood. Because chickens like company -- they are flock animals, after all -- having a lone hen for your egg-producing needs isn't the best idea. Part of having a good pet is keeping that pet happy and fulfilled, and friendship is a part of that. That said, there's no need to overdo it either. Generally speaking, one hen produces enough eggs to feed one person, so keep that in mind as you plan your flock. And don't forget to interact with your birds; experts say chickens not only feel empathy, but can bond with owners. If owners of home-raised chickens can offer the aforementioned basics, chickens as pets can not only flourish but provide exciting benefits. Enjoying fresh eggs on the regular is the most obvious advantage to a backyard flock, but chickens are also natural exterminators. Their innate urge to peck for and eat grubs and other small insects can help keep your yard and home pest-free. Another upside? Chicken manure is a nutrient-rich organic fertilizer that can help your lawn and gardens grow more lush and verdant. No more trekking to the garden supply store for bags of fertilizer -- you've got your own! Though the appeal of backyard hens is high, be clear that these feathered friends are still pets that require time and attention. Always ensure your flock is given daily care, even when you're away from home. If this can't be done, chickens may not be the perfect pets for you. Petful.com: Do Chickens Make Good Pets? Science World: Could Chickens Be Empathetic Creatures?